Below are just a few of Zobel & Co. Kitchens latest remodeling projects. Browse through them to get ideas for your new custom kitchen. Click on any image to open the gallery to full view. Visit out Houzz page for many more projects. Create an idea book on Houzz to get started on your new custom kitchen. Who says the white kitchens are a current trend? This kitchen was a white traditional kitchen , 1970's era. Popular at the time, hanging cabinets over the peninsula visually cut off the kitchen from dining area. 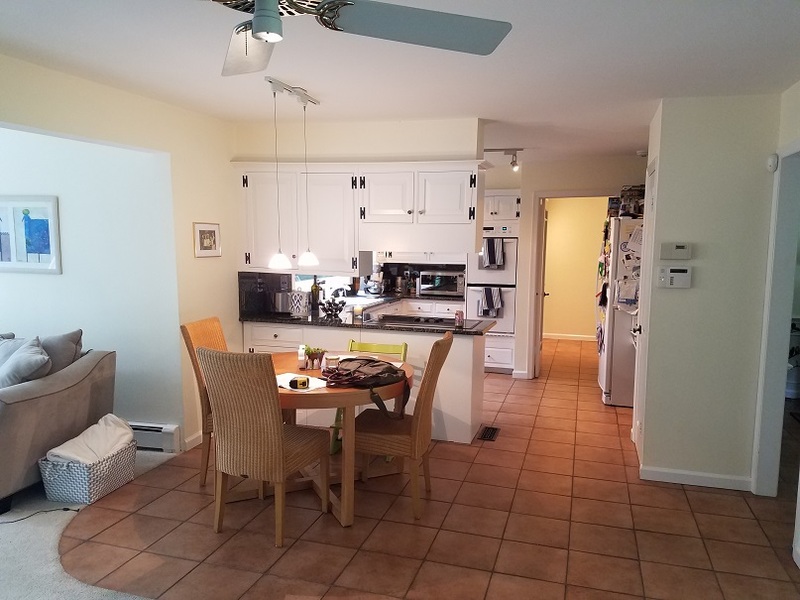 By removing the hanging cabinets and moving the peninsula wall to the edge of the living room wall, Arthur was able to create a much larger kitchen. The clean lines of the kitchen, recessed panel door style, stainless steel and black appliances, waterfall counter top and the wood-style ceramic floor tile give this kitchen a contemporary flare with a slight nod to the homeowners' European decent. 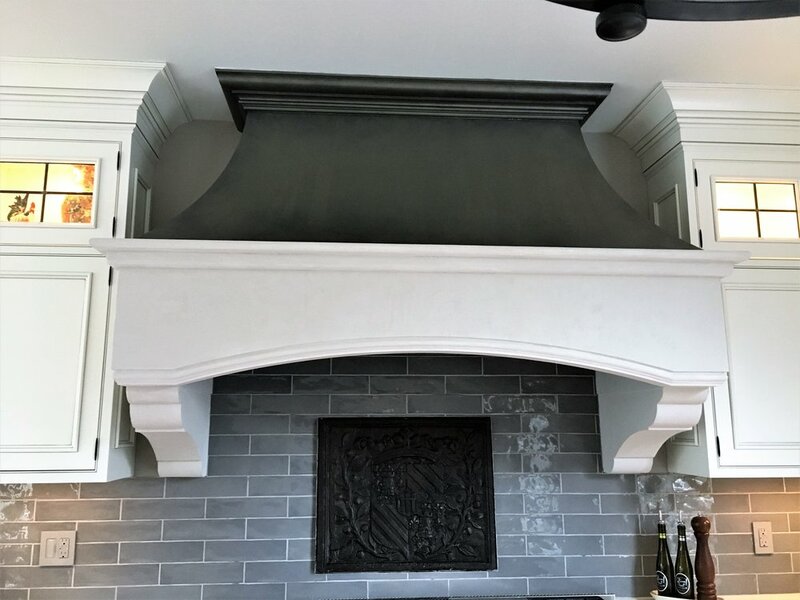 Adding built-in cabinetry to flank the fireplace creates a smooth, seamless appearance and gives a home to the bar and television. Some say French Country is dead, but we know that's not true. 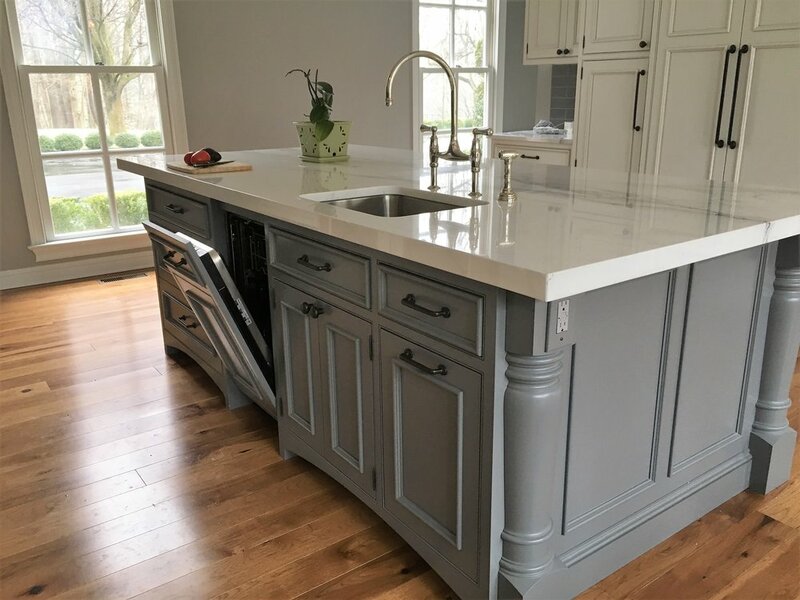 We created this modern French Country design using hand-crafted beaded-inset cabinets, a classic apron farm sink, a traditional yet commanding hood with curves, angles and corbels, and detailed crown molding. 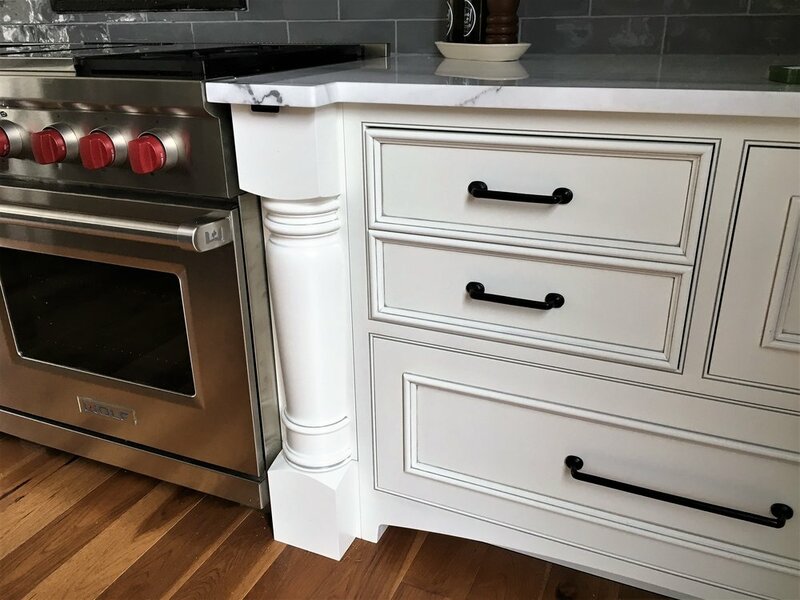 The finer touches are subtle but important, such as arched toe-kicks, a 5 cm thick marble counter top on the island, leaded glass cabinet doors, and interior cabinet lighting. 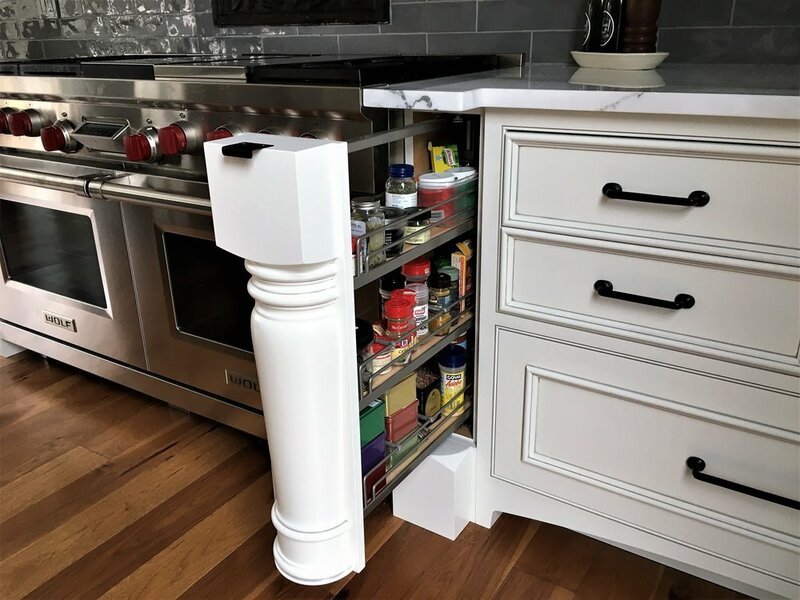 Notice the hidden storage around the stove, the convenient plugs discreetly built into the island, and paneled dishwasher and refrigerators. 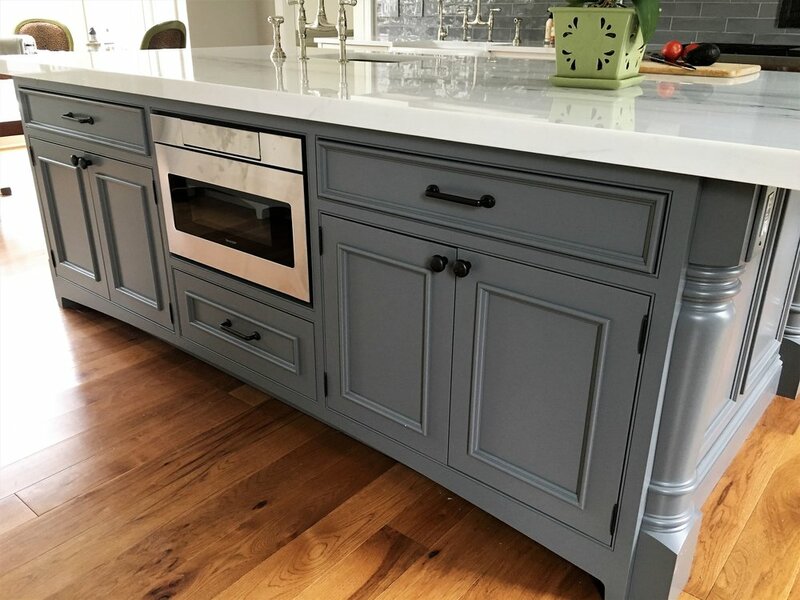 Chock full of details...from hand crafted beaded inset doors, to leaded glass glass cabinet doors to a classic French Country hood, this kitchen makes a dramatic statement. We took this 1970s kitchen and transformed it into a modern transitional kitchen. By replacing the L-shaped peninsula with an island we opened up the kitchen. This improved the work flow, removed the barrier to the dining table and created a lighter look and feel. Two tone kitchens are increasingly popular, and you can see why in this kitchen. The dark island creates a focal point. Top cabinets with glass doors and interior lighting give an elegance as well. Taking the cabinets up to the ceiling not only added storage but visually made the kitchen bigger. You can see we didn't change the basic floor plan, just removed the peninsula and replaced it with an island. While the peninsula provided storage it also blocked the flow of the kitchen. The ovens and microwave were all stacked together. 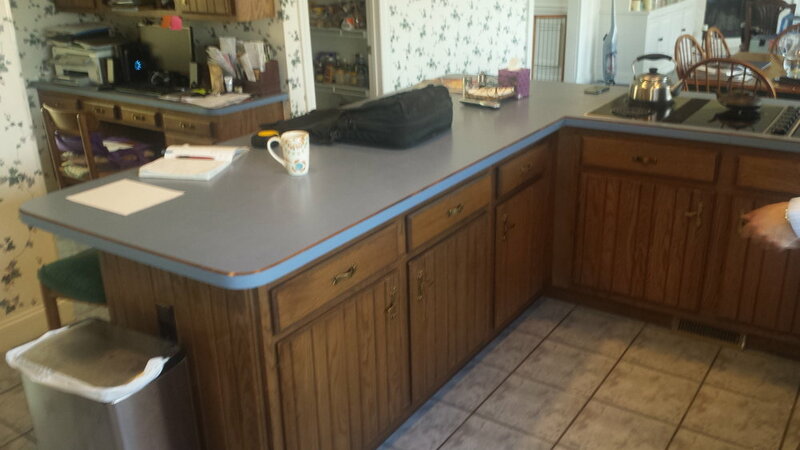 This view, without the island, lets you see how the new cabinets will look. Now the island is in place. The kitchen has a lighter feel and is more functional because the island provides storage and counter space but doesn't block the flow. This view shows the new desk with the closet pantry door closed. We put the refrigerator where the oven were, and put the wall ovens away from the stove so that work area isn't so crowded. This view shows the island detail as well as how the eating area and living room blend in.